The information domain requires a level of speed significantly faster than the traditional domains, so the Army to rapidly integrating these capabilities into formations and even organizational changes, according to a top service official. Army Cyber Command, despite its name, is responsible for integrating and conducting not only cyberspace, but also electronic warfare and information operations. These capabilities, to some extent to include intelligence and space, are now being considered to be under the larger information-related banner of indirect and indirect operations that support U.S. and allied objectives and/or to degrade adversary functions. Much of what Army Cyber Command does today in the form of supporting combatant commanders around the world is deliver content, a capability that is used to create an information operation, Lt. Gen. Stephen Fogarty, commander of Army Cyber Command, told the AFCEA Army Signal Conference March 13. A chart provided during his presentation listed the command’s lines of effort, including a transition to what could be called Army Information Warfare Operations Command by 2028. Fogarty in the past has discussed the notion of Army Cyber Command becoming something like Army INFOWARCOM. The intensity of operations in the Middle East over the past decade-plus has provided an unprecedented learning laboratory for Cyber Command to test concepts and forces. After focusing on the cyber and electronic warfare pieces intensely, “what we’re pushing on for the next 18 months is to focus on our information operations component and then how we knit all that together for a coherent information warfare capability,” Fogarty said. Details weren’t immediately clear regarding what specifically these information components will be, but the reason for them is more apparent. Adversaries, namely Russia, have leveraged the cyber domain to conduct cyber-enabled information operations, as evidenced in the operations in 2016 orchestrated to influence the American electorate. This involved establishing fake news websites along with an army of social media personas and publishing a combination of untrue information and information leaked from documents stolen via cyber means. In a Feb. 27 podcast for the Lawfare Blog, Dmitri Alperovitch, co-founder and chief technology officer at CrowdStrike, a cyber firm, noted that North Korea is very good at these operations. He pointed out they did this even before the Russian election operations in 2016 during the 2014 Sony Pictures hack. “They were the first ones to use information operations. We focus so much on Russia, but two years before Russia we had Sony. And I think the U.S. government and most of us in industry fundamentally misunderstood Sony because we so much focused on the destructive element of the Sony Pictures attack that we forgot that they stole emails and leaked them to WikiLeaks two years before Russia,” Alperovitch said of the North Koreans. Fogarty explained that the United States needs to get faster and more agile in this information domain. Fogarty noted that commanders need to visualize what adversaries are doing in the information domain. “That’s what we struggle with, to be able to sense and understand that at the speed that I believe is required to be able to turn inside the adversary,” he said. Commanders need to be able to filter information rapidly and not be fooled by the adversary trying to use deceptive tactics, which is much harder in the information domain than assessing if the adversary is using things like decoys in the physical domains. “I think because of the volume, the variety, the velocity of information, the native language on the internet, that becomes very, very challenging. That’s my task. That’s where I need industry help,” Fogarty said. While these types of operations from a U.S. military perspective have typically occurred more on the tactical side, Fogarty told the audience that earlier in the day he had a video conference with the director of operations at U.S. Cyber Command, which is responsible for cyber-IP-based operations more at the strategic level, regarding an ongoing operation. The operation, Fogarty said, is probably more of an information operation than cyber as cyber is enabling for it. On the Army side, Fogarty explained in the future there will likely be a field manual for commanders on information operations because it’s vital for commanders. Russia and China have shown they understand the importance of controlling information as well as denying adversaries advantages afforded by GPS. The Marine Corps is similarly viewing the importance of the information domain and integrated formations establishing units at each of the three Marine Expeditionary Forces that will include cyber, electronic warfare, signals intelligence and information capabilities in them. Fogarty explained that the Army is charting ahead with major organization changes. 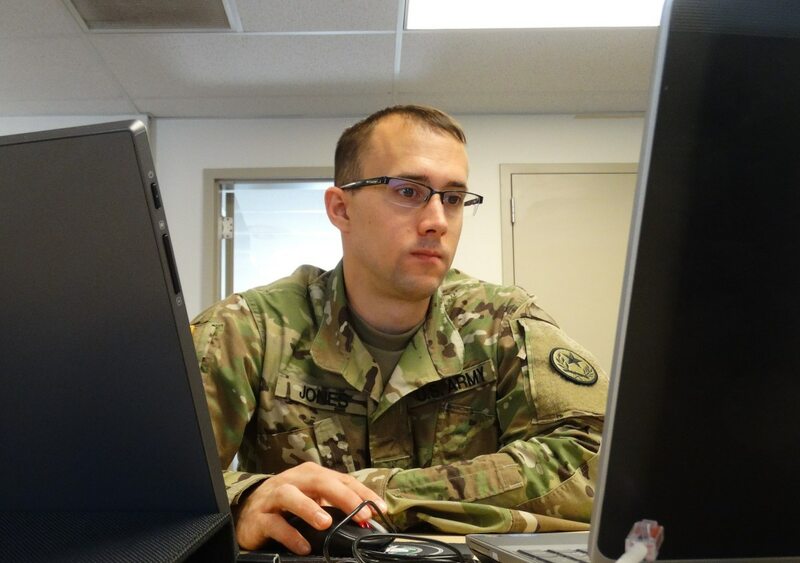 “As we transform the command, it’s not just a change in name, it’s not just a change in how we think — it’s going to be changes in relationships, in organizations, in training, in capabilities,” Fogarty said, referencing the 2020 move of Army Cyber Command from Fort Belvoir to Fort Gordon, which will be the new Army hub for information dominance and power projection in the information domain. “The power we’re going to project from there is not the traditional military power that we measure ourselves by … What I have is a connection to the internet, I’ve got good power, I’ve got a trained workforce. The power we’re going to project is information,” Fogarty said.